A good first step in any event planning venture is choosing the venue. Most venues have an event planner or a person on hand that can aid clients in the logistics of the event from things like music to of course catering. Planners are usually knowledgeable about which caterers are reliable and work well for their space. In 2018 Amazing Edibles Catering hopes to expand and build on our existing vendor/venue relationships in order to better serve you! 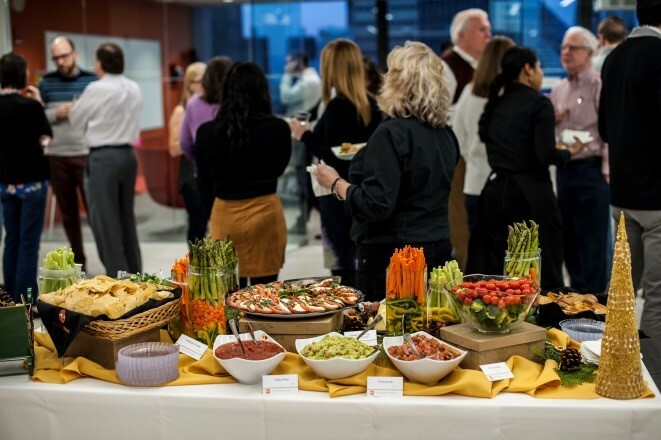 During this coming year we expect to meet lots of new people, serve more spaces & capture additional business by reminding venues that Amazing Edibles Catering is a first-class food service option. We believe one of our greatest strengths that'll help us build these partnerships is that we are very friendly and very genuine. We work hard to establish long-term partnerships, having proven ourselves to be reliable, professional, and meticulous with details. As a certified minority women-owned business entering our 24th year in business, having had the pleasure of serving thousands of non-profit, educational, corporate and social clients we understand that it is our vast knowledge and dedication to service that keeps our clients satisfied.